My life is in Haiti right now. But sometimes I have to travel back to the US and when I do my time is usually filled with fundraisers, meetings, and administrative catch up. When I’m lucky I get to invest some time in making art and visiting with friends and family. But my time in the US seldom includes room for investing in my own spiritual well being or exploring new ways of experiencing God in different spaces and environments. This time back to the US I have made a decided commitment to change that. All of those other things that I have to do require me to do quite a bit of traveling and so I’m adding it to my agenda in each new place that I pass through to visit a certain sacred space and spend some time encountering the unique holy histories that exist in each one. Although this is a personal journey, I believe that we never truly can experience God ourselves unless we are willing to discover and affirm the ways that the Sacred presents itself to other humans who are each on their own journeys as well. So I will be sharing my experiences here on the blog in the hopes that others can find something of value in what I learn myself. Feeling the journey is primary, but sharing it will also be important to me. Seven young children were out playing one day, collecting flowers and berries, and chasing antelope. They had wandered far from home following where nature led them when they realized that they were lost. They looked all around, each pointing in different directions, but they could not find the way home. Then one of the children noticed a giant bear coming towards them and yelled to the others. They all turned to run away as fast as they could and the bear chased them swiftly running behind. After running as far as they could they slowed and found that even more bears were now closing in on them, all great and terrifying. With no where to run they knew that they would soon be devoured by the bears so they all gathered close together and prayed to the Great Spirit to save them. The Great Spirit had pity on them and the ground beneath them began to tremble and raise up from the earth. 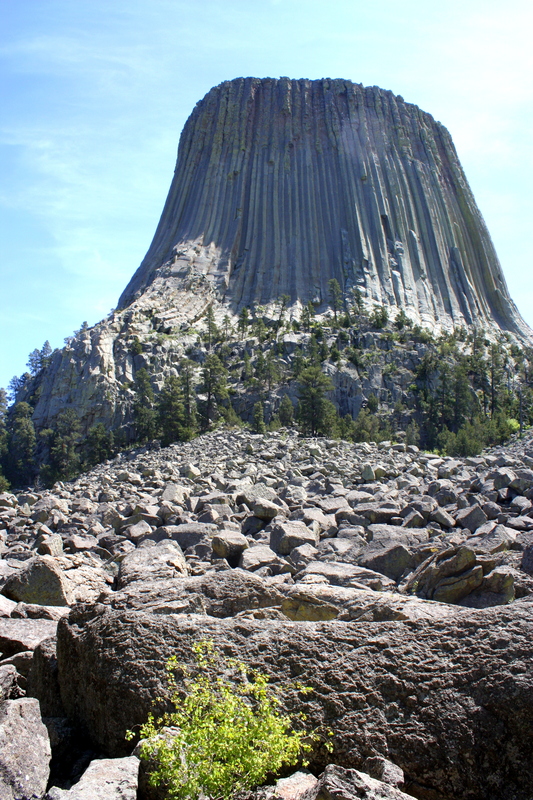 The bears dug their claws into the rock tower trying to climb it as it rose into the sky but they only slid down it as it continued to rise with the children on top higher and higher out of the bears’ reach. The children now rose into the sky and the Great Spirit turned them into the constellation Pleiades, which still shine over the tower and the plains every night. This is a powerful narrative to me. Anyone who’s read my book knows how much I love a good metaphor of people turning into stars. So I went up there last week to get in touch with the sacred energy that exists there and spend some time reflecting on what it means to be lost and desperate for salvation in this world. I had driven past the tower from a distance before but never had actually been up to the base on the hiking trail to spend time within the hallowed environment there. And yet, it is difficult to truly call it hallowed because it is indeed a sacred space, but it has also been turned into a tourist attraction as well. So one must be very intentional to find the Sacred there despite the tourists and the rock climbers and the guides. But if you go with that intention, and take a step off of the trail and just take a deep breath, then it is impossible to deny that you are in the presence of something holy and powerful. And I think that whenever you do have to opportunity to stand in that presence, you must allow yourself to surrender to whatever the Spirit has to say to you. So I took the chance and found a large rock to sit behind for some meditation where no guide could yell at me for leaving the trail and I wouldn’t be able to hear the tourists talking about their zumba classes and kids’ last weeks at school. I had to take a moment to escape from the bears that may be chasing me down in this world. Sometimes living in Haiti and trying to do work that you know is good can feel like that. So many outside forces constantly after you, impossible to escape, and everyday you feel like they’re about to devour you. It makes you want to cry out to the Great Spirit, “I don’t get it! I just came out here to pick berries and now I’m running for my life! I just want to go home!” But then you realize that the Great Spirit is made of Love and will lift you up, place you in the sky, and give you a new home. Salvation when you’re lost. But in order for any of us to find that new home ourselves, we must first find the place within ourselves where the Great Spirit may be at home. As I continue to visit other sacred locations within this world, I think that the real part of the journey will be discovering the sacred space that resides within me and being more conscious of what I allow into it. Those other influences can keep clawing away, trying to get at me, but I have to make a covenant with myself to continue rising above. 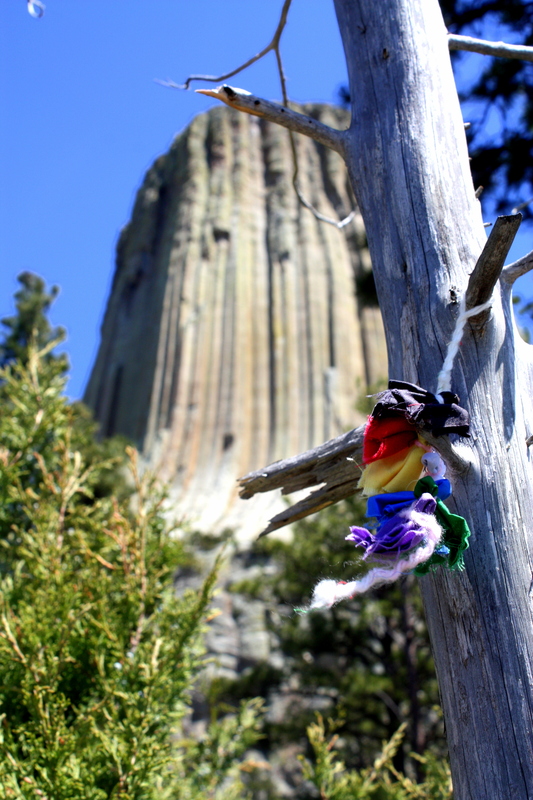 One of the greatest parts of praying at Devils Tower is knowing that you’re not alone. All around the tower are prayer cloths tied to the branches of trees. Traditional practice by native tribes of the area, these cloths are left behind so that their surroundings may be anointed by the prayers and intentions of the maker and act as a blessing to those who may come into that space after them. It serves as an inspiration to me, a solitary sojourner, to see these remnants of other people’s sacred encounters in that place. Although I don’t know who they are or what they prayed for and they don’t know me, I know that they were there with the same Spirit that I am there and they left behind a blessing that I am now a part of. They don’t kneed to know what tribe I am from or what name I have for my God or the Spirit that we are connected through, with their prayer cloths, they welcome me into that space to commune with the sacred energy of nature and humanity. They invite me to draw my eyes upward, gaze into the heavens, and discover salvation. Discover peace. I am not sure where my next step in this pilgrimage will land, but I hope that you will continue to join me as I journey. If you have any suggestions of places I should visit, I’d love to hear them. 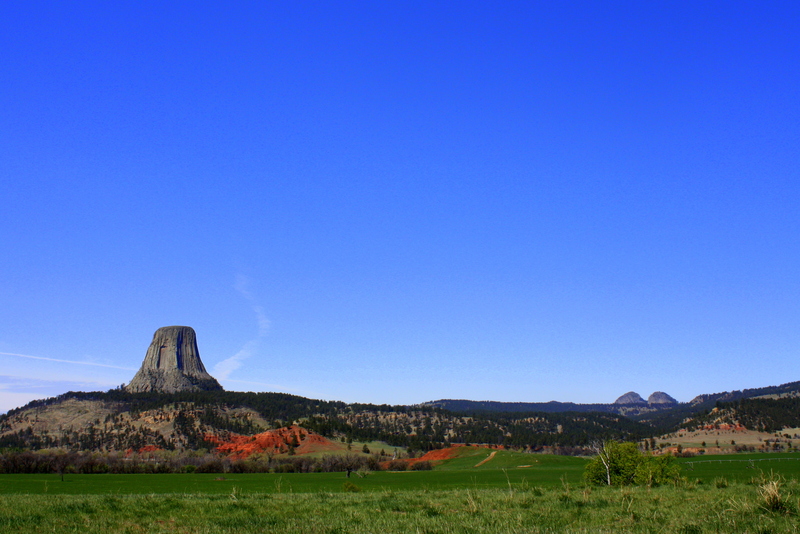 For now, if you do get the chance to visit Devils Tower, please take it and know that behind a large rock on the south side of tower there is a prayer left for you from me.